Tigers lefty Matt Moore is slated to miss the remainder of the 2019 season, the club told reporters including MLB.com’s Jason Beck (Twitter link). While the procedure was known, the prognosis comes as quite a surprise. It had been expected that Moore wouldn’t be sidelined for more than six weeks or so, as he was slated only to undergo a common procedure to address a meniscus tear. The reason for the change in the outlook isn’t yet known, but something obviously didn’t go as anticipated. This news represents poor fortune all around. The Detroit organization will come away with little to show for the $2.5MM it invested in Moore last winter. And Moore won’t get a full shot to boost his value before reentering the market. The 29-year-old southpaw did turn in two scoreless outings, compiling nine strikeouts against one walk over ten frames, before going down with what seemed to be a minor injury. That included a promising jump to a 14.5% swinging-strike rate, so it’s at least conceivable that some teams will have seen enough to make an investment in the still-youthful hurler based only upon that limited showing. Moore follows Michael Fulmer in suffering a season-ending injury. It seems the Tigers will now have little choice but to give a full run to Daniel Norris, who is facing something of a make or break year. Other depth options include Ryan Carpenter and Matt Hall. The club may at some point also take a look at some of its lauded young pitching prospects who don’t yet have 40-man roster spots. DECEMBER 4: The deal has now been announced. NOVEMBER 27, 7:06pm: The guarantee is $2.5MM, Chris Cotillo of MassLive.com tweets. The contract also includes $1MM in potential incentives. 12:18pm: The Tigers and left-hander Matt Moore are in agreement on a one-year deal, reports Yahoo’s Jeff Passan (Twitter link). Mark Feinsand of MLB.com had indicated that the two sides were in talks just prior to that report (also via Twitter). Specific parameters aren’t clear, but Feinsand and Passan both suggest Moore would be looking at a guarantee in the range of $2-3MM. The deal is pending a physical. Moore is represented by Sosnick, Cobbe & Karon. Moore, still just 29, has struggled through a pair of awful seasons and would be a buy-low option for the Detroit rotation. Once considered the best pitching prospect in the game — Baseball America rated Bryce Harper, Moore and Mike Trout the game’s top three overall prospects prior to the 2012 season — Moore’s career came to a screeching halt in 2014 when he underwent Tommy John surgery. To that point, Moore had amassed 347 big league innings with a 3.53 ERA, 8.8 K/9, 4.3 BB/9 and 0.9 HR/9 all before celebrating his 25th birthday. Moore struggled in his return from the ligament replacement procedure late in the 2015 campaign but gave some reason for optimism when he tossed a career-high 198 1/3 innings of 4.08 ERA ball in 2016. His velocity hadn’t quite returned to its peak levels but was on the upswing, and Moore looked to be on the path to reestablishing himself. Unfortunately for both Moore and the Giants — who acquired him from the Rays midway through that solid 2016 campaign — the left-hander completely unraveled in 2017. Since Opening Day that season, he’s been clobbered for a 5.99 ERA in 276 1/3 innings of work. Moore has averaged 10.7 hits and 1.5 home runs per nine innings pitched during that time, and his strikeout rate has fallen sharply (7.5 K/9). Over the past two seasons, he ranks 123rd of 125 pitchers in ERA (min. 200 innings), 107th in FIP and 117th in xFIP. Those struggles won’t matter much to the Tigers, who are hoping to catch lightning in a bottle with the once-vaunted left-hander. Moore will slide into the back of a rotation that will be devoid of any expectations. Michael Fulmer, Jordan Zimmermann, Matthew Boyd and Daniel Norris are the top candidates to join Moore in manager Ron Gardenhire’s rotation next year, though the Detroit organization has an extremely promising wave of starting pitching prospects on the horizon. Matt Manning, Franklin Perez, Beau Burrows and 2018 No. 1 overall draft pick Casey Mize are all rising through the ranks and could soon arrive to give the rebuilding Tigers some hope for years to come. In the meantime, Detroit will turn to low-risk stopgaps like Moore (and, a year prior, Mike Fiers and Francisco Liriano) in hopes of extracting some quality innings at a reasonable price point. Should they succeed in this instance, Moore will quickly become a trade chip next June or July. The Rangers have declined club options over catcher Robinson Chirinos and pitchers Doug Fister, Matt Moore, and Martin Perez. That’s a surprising move on the veteran backstop, though all three hurlers seemed destined to be sent onto the open market. The Texas organization has also announced a long list of players who were outrighted from the 40-man roster. Austin Bibens-Dirkx, Clayton Blackburn, Brandon Mann, Carlos Perez, and Ryan Rua are all weighing outright assignments after seemingly clearing waivers. Chirinos, 34, had seemed a fairly easy choice to remain behind the dish in Texas. His option had risen in value to $4.5MM due to plate-appearance escalators, Joel Sherman of the New York Post notes on Twitter, but the team will pay him $1MM just to walk away. While Chirinos is not noted for his skill behind the dish — in particular, he slipped to dreadful framing ratings in 2018 — he’s a highly respected player. And he also has consistently delivered much more offensive than the average catcher, with a .233/.324/.438 career slash and 35 home runs over the 735 plate appearances he has accrued since the start of 2017. All three pitchers will be looking for bounceback opportunities after forgettable seasons. Fister will receive a $500K buyout; his option was priced at $4.5MM. The Moore deal included a $750K buyout, which he’ll take home in lieu of a $10MM payday. Perez, meanwhile, gets $1MM in total buyouts as the club passes on its chance to keep him in 2019 ($7.5MM) and 2020 ($9MM). The Rangers are moving veteran left-hander Matt Moore from the starting rotation to the bullpen, tweets Jeff Wilson of the Fort Worth Star-Telegram. Fellow left-hander Yohander Mendez will start for Texas in Moore’s place on Friday. It’s a disappointing outcome for both team and player, though Moore received perhaps a longer leash than his early results would’ve otherwise dictated. Through 56 innings with the Rangers, Moore has been hammered for a 7.88 ERA, averaging 6.6 K/9 against 4.2 BB/9 and 1.29 HR/9. To be sure, there’s been some degree of poor fortune at play, as Moore’s .394 BABIP and 59.9 percent strand rate look fluky. But his K/BB numbers are still the worst of his career, and fielding-independent metrics like FIP, xFIP and SIERA all still peg him north of 5.00. The brutal start to the season for Moore is the continuation of a rather precipitous decline for the once-vaunted prospect. 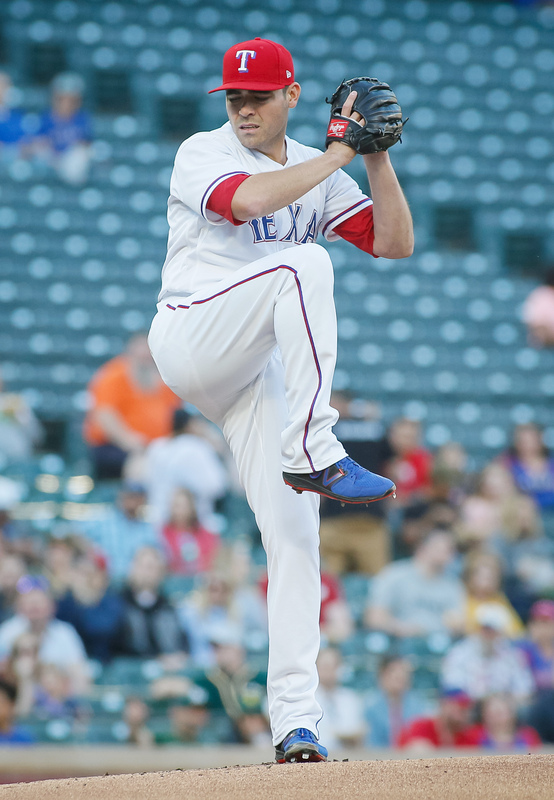 Prior to the 2012 season, each of Baseball America, MLB.com and Baseball Prospectus considered Moore among the top two overall prospects in all of baseball, and he lived up to the hype early on, making the All-Star team and earning some Cy Young votes in an excellent age-24 season back in 2013. Moore, though, required Tommy John surgery in 2014 and has never recaptured his front-of-the-rotation form since returning. He did toss 198 1/3 frames of 4.08 ERA ball between Tampa Bay and San Francisco in 2016 — a solid season that looked to set him back on track at the very least as a serviceable mid-rotation piece — but he’s followed that up with 230 1/3 innings of a 6.10 ERA and 4.83 FIP. Shortly after making his MLB debut, Moore agreed to a five-year, $14MM deal with the Rays that included club options for both the 2018 and 2019 seasons. While that deal long looked to be one of the best bargains in baseball, it now suddenly looks unlikely that Texas will even exercise its $10MM club option over Moore for the ’19 season. The Rangers didn’t give up much to acquire Moore and some international bonus allotments from the Giants, sending minor leaguers Israel Cruz and Sam Wolff back to the Giants in exchange. The addition was one of several low-cost pickups for the rotation this winter, but the majority of those moves have failed to pay dividends. As for Mendez, he’s a former top 100 prospect whose star has dimmed a bit in recent years. Though he posted respectable numbers in Double-A last season, he’s off to a miserable start in Triple-A Round Rock, where he’s struggled to a 5.26 ERA with 7.0 K/9, 4.0 BB/9, 1.75 HR/9 and a 41.4 percent ground-ball rate. That said, Mendez only turned 23 back in January and has pitched better over his past five appearances (4.00 ERA, 25-to-9 K/BB ratio in 27 innings), and frankly, Moore’s persistent struggles simply make it difficult to keep trotting him out there as a starter. Timeless right-hander Bartolo Colon celebrated his 45th birthday this week, so he’ll soon become just the 18th player in major league history to pitch in the majors beyond that benchmark. Colon is also the oldest to hurl a pitch since Jamie Moyer back in 2012. Value metrics are divided on his effectiveness so far this season; Baseball Reference pegs his contributions at 1.6 WAR, while Fangraphs believes his 2018 production to be exactly replacement level. In any case, it would have been difficult at season’s outset to imagine Colon exceeding his current results. A 3.51 ERA and 7.20 K/BB ratio are welcome numbers to a Rangers rotation that sports the sixth-highest combined ERA in major-league baseball. In other Rangers news, Jeff Wilson of the Star Telegram examines the job security of a pitcher and a position player in Arlington. Austin Bibens-Dirkx pitched well on the whole in his last start (though he was a victim of some bad fielding behind him), Wilson notes that the club is more likely to give Matt Moore a longer look before ceding his spot in the rotation to Bibens-Dirkx. Meanwhile, Wilson notes that struggling second baseman Rougned Odor has two options remaining. With Jurickson Profar putting together quality at-bats of late, and Isiah Kiner-Falefa producing at a better clip than Odor, there’s a chance the club might consider letting the latter work out his issues in the minors. In a subscription-only piece for The Athletic, Bill Shaikin examines the storyline of Alex Anthopoulos leaving the Dodgers organization to run a Braves club that’s currently leading the NL East. While Anthopoulos felt like he had “as good a job as there was in baseball” with the Dodgers, his reshaping of the Braves’ payroll has helped to set them up for success as they near the end of a lengthy rebuild. Trades of Jim Johnson, Matt Kemp and some international bonus pool money shipped to the Angels has set the stage for Atlanta to complement its young core through free agency and perhaps even the midseason trade market. Rob Biertempfel of the Pittsburgh Post-Gazette provides an update on Pirates prospect Bae Ji-hwan via Twitter. Bae is reportedly on his way back to the United States after cooperating with police in South Korea on suspicion of a domestic violence incident. He’ll be allowed to participate in baseball activities pending the outcome of an investigation into said incident. Bae was one of a few players that the Braves reportedly offered “extra-contractual compensation” recently and were thus barred from signing in the last international signing period.